The Best Places to Ice Skate in Missouri! An ice rink may not be the first thing city founders think to build, but Missouri has a wide selection of enjoyable and affordable rinks that appeal to everyone from first timers to professionals. A full half of those are in the St. Louis area—because St. Louis is a hockey town to rival anything up north! Here are the 10 best Missouri ice skating rinks to practice your skills or simply enjoy a day of fun. One of the training centers for the University of Missouri hockey team, Washington Park Ice Arena in Jefferson City offers a range of services, including beginner and advanced skating lessons, hockey, figure skating, and speed-skating. A family friendly reputation, inexpensive snacks, and a welcoming staff help make this one of the best skating rinks in Missouri. The Creve Coeur Ice Arena is an indoor facility located within the Dielmann Recreation Complex and is open year-round. The arena hosts birthday parties, clubs and organizations, “Stick and Puck” sessions, and even figure skating training. The arena also takes precautions to monitor the air quality within the rink, to ensure the best possible experience for patrons and their guests.The Creve Coeur Ice Arena is an indoor facility located within the Dielmann Recreation Complex and is open year-round. The arena hosts birthday parties, clubs and organizations, “Stick and Puck” sessions, and even figure skating training. The arena also takes precautions to monitor the air quality within the rink, to ensure the best possible experience for patrons and their guests. Ice Terrace in Kansas City, Missouri, has been providing fun for the whole family since 1972. Part of the Crown Center complex, owned and operated by the Hallmark Corporation and a fixture of Kansas City’s downtown since the mid-60s, Ice Terrace is open from early November to mid-March, and is Kansas City’s only public outdoor ice skating rink. After Thanksgiving, skaters get a great view of the Mayor’s Christmas Tree. Hot chocolate from Panera Bread rounds out a fun day! The Bode Sports Complex in St. Joseph is home to an indoor basketball court, an in-line skating rink, a skate park, and an ice rink. The Bode Ice Arena offers lessons in both regular ice skating and hockey skating, has private rooms for rental, and even a warming room for those who don’t like to freeze on the ice! It’s home to six different hockey teams and the St. Joseph Figure Skating Club, and fans say it has a friendly family atmosphere. Admission to the Bode Ice Park is $5, and skate rental is available. Those in the Springfield area might remember when this facility was Jordan Valley Ice Park, but a large donation by Mediacom secured naming rights—and a lot of money for significant improvements and expansion. The Ice Park offers both recreational and competitive skating, including classes and private lessons, teams, figure skating, and facilities for parties and events. It’s also the home of the Missouri State ice hockey team, the Jordan Valley Figure Skating Club, and several youth hockey leagues. Admission is $5 for everyone. It wouldn’t be a Missouri’s-best list if Forrest Park didn’t make an appearance somewhere, right? This list’s appearance is Steinberg Skating Rink, the Midwest’s largest outdoor ice rink. It’s always open-skate at Steinberg, and they stay open for skating all year-round. They even have a concession stand, the Snowflake Café, that serves soda for hot days, hot chocolate for cold days, and beer and wine for any day. Steinberg Skating Rink is perfect for a romantic day for tourists, or just for a fun day for St. Louis natives. The Webster Groves Ice Arena is located inside the Webster Groves Recreation Complex, which also includes an indoor aquatic center, fitness center, and tennis center. The Ice Arena offers year-round classes, as well as private lessons, taught by skating professionals. It also houses local, high school, and college hockey teams, and puts on both spring and holiday ice shows. The arena has three private skating rooms that can be rented out, and it holds weekly adult scrimmage games for those grown-ups not quite ready to leave their hockey days behind. The Kirkwood Ice Rink was the first facility in Missouri to gain recognition from the USA Hockey Association as a Model Association, which means that its youth hockey programs meet standards that set the example for other programs across the nation. Kirkwood also offers discount prices for Kirkwood residents, reducing their already low admission and skate rental prices. In addition, they have not only hockey teams, but speed skating teams, and offer freestyle practice time for figure skaters as well. While the St. Louis area has a significant number of high quality rinks, few can match the breadth and value of the services provided by the Kirkwood Ice Rink. It was a close call but in the end, it was the St. Louis Blues that bumped Hardee’s IcePlex up over Kirkwood Ice Rink. Both are in suburbs of St. Louis, both are in townships that can afford state-of-the-art-facilities, both are way better than your regular old neighborhood ice rink, but both the St. Louis Blues Amateur Team and the St. Louis Blues Alumni team make their home in Chesterfield, and in a hockey town, that’s a pretty major credential. It’s also an outlet for licensed Blues-wear, and for Blues game tickets. 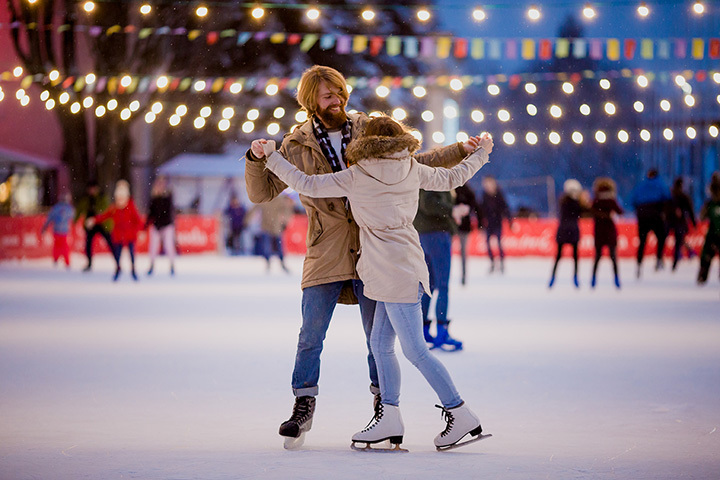 In addition to past or future professionals, residents and visitors can skate there too, by taking lessons, playing on teams, or attending either the hockey or figure skating freestyle sessions. And there are public open-rink sessions for those who skate just for fun. View more Missouri Ice Skating Rinks.